Hello, everyone! Three weeks, three videos and three blog post in a row. I am so happy I am finally getting back on track with filming, editing and of course crocheting, which is my favorite thing to do. 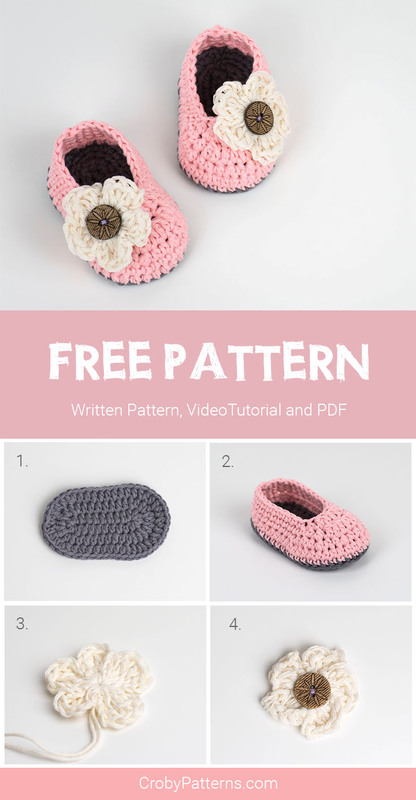 Last week I was showing you what did I purchase in my recent yarn haul, two weeks ago I was sharing with you a pattern for crochet baby Granny Square romper and this week we will create a pair of cute baby booties for little girls. YARN: DK weight 100% cotton yarn (Drops Cotton Light) in three colors; gray, pink and beige. YOU WILL ALSO NEED: a pair of scissors (HERE! ), stitch markers (HERE! ), a yarn needle (HERE! ), 2 buttons (2 cm in diameter). You can find this pattern as an inexpensive, ad-free, beautifully designed PDF pattern on Etsy, Ravelry and Love Crochet. The PDF pattern has one additional size: 6 – 12 months. GAUGE: 9 sts and 9 rows in sc measure 5 x 5 cm or 2 x 2 in. Use a stitch marker to mark your first stitch of the row/round. How to read a pattern: If the number is written before the stitch 3 hdc work 3 hdc into the same stitch. If the number is written after the stitch hdc 3, work hdc into next 3 stitches. Repeat what is written in the () as many times as it’s written right after the (). For an example: Repeat (2 hdc, hdc 1) 5 times. It means that you have to repeat the sequence work 2 hdc sts into the same st, 1 hdc into the next one 5 times. And you will get 5 additional sts by doing that. The slip stitch is just a joining stitch and does not count as a stitch in my patterns. Ch 10. Start in the 2nd chain from the hook. Work into back loops only. Round 1: Work 2 hdc into the same. 1 hdc into next 7 chains. Work all 6 hdc sts into the last ch. 1 hdc into next 7 chains. Work 2 hdc sts into the last one. Join the round with a ss. = 24 sts. Round 2: Work 2 hdc into next 2 sts. 1 hdc into next 7 sts. Work 2 hdc sts into next 6 sts. 1 hdc into next 7 sts. Work 2 hdc into next 2 sts. Join the round with a ss. = 34 sts. Round 3: Repeat (2 hdc, 1 hdc) 2 times. Hdc 7. Repeat (2 hdc, 1 hdc) 6 times. Hdc 7. Repeat (2 hdc, 1 hdc) 2 times. Join the round with a ss. = 44 sts. Cut the yarn and weave in the yarn end. Round 1: Join the yarn in the middle of the heel with ch 1. Start in the same stitch. Work 1 sc into BLO into next 44 sts. Join the round with a ss. =44 sts. Round 2: Ch 1. Work 1 hdc into next 44 sts. Join the round with a ss. = 44 sts. Round 3: Ch 1. Work 1 sc into next 11. Repeat (hdc2tog, hdc 2) 5 times. Hdc2tog. Work 1 sc into next 11 sts. Ss. = 38 sts. Round 4: Ch 1. Work 1 sc into next 12 sts. 1 hdc. Hdc2tog. Repeat dc2tog 4 times. Hdc2tog. 1hdc. Work 1 sc into next 12 sts. Ss.= 32 sts. Round 5: Ch 1. Work 1 sc into next 10 sts. Hdc2tog. Repeat dc2tog 4 times. Hdc2tog. Work 1 sc into next 10 sts. Ss. = 26 sts. Cut the yarn. Fasten off. Create a magic ring and work all the sts into the magic ring. Chain 4. Work 3 tr sts into the magic ring. Ch 3. Work 1 ss into the magic ring. Repeat (Ch 3. Work 3 tr into the magic ring. Ch 3. Work 1 ss into the magic ring.) 4 times. Now pull the tail and close the magic ring. Make a nice knot and attach the button on the center of the flower. Hi there! All the content you can find (including crochet patterns) here on this website crobypatterns.com is a property of Croby Patterns. I put a lot of work and love into creative ideas, patterns and educational materials provided on this website, so please do not modify, copy, sell or share it as your own. I do not give any permission to translate, make videos or crochet courses using content provided on crobypatterns.com. You can sell finished items handmade from my crochet patterns made in a limited number, but please clearly credit the design to me, Croby Patterns and provide a link to my blog crobypatterns.com. Thank you for respecting me and my work! Many thanks, unusual to find an explanation with such clear guidance. ? I did this for my twin daughters-to-be. Thank you for your tutorial, it’s so easy to understand and so beautiful to inspire everyone!!!!! I hope I could share my photo here ^^. You are so great!!!!!!!! Thank you so much for the sincere sharing and guidance…. It turn out beautifully…. Regards and god bless ? These are so cute. Instructions are very very easy to understand without any confusion. Thanks for sharing ? Thank you for sharing! You have given me so much confidence when making the booties. When I read your pattern notes a light came on for me. Everything has been so much easier to understand. Thank you ssssoooo much for sharing your talents! What a beautiful pattern! I am making these for my 22nd granddaughter! Please tell me how to get to the PDF for this pattern? For some reason I cannot find the link. THANK YOU AGAIN!! Hi Lisa! There is no PDF pattern for these baby booties at the moment, I am so sorry. How do I get a written copy of the baby booties pattern? I tried to print this pattern but it won’t print out! I want to make the booties before this coming weekend for my niece’s shower. Thanks for sharing these cute baby girl booties! Could you use 4ply 100% cotton for these or do you think they’ll be too small? Thank you! Hi Florence! The text and photos are copy protected. I had to do that because too many people were copying the patterns and were trying to post them on their websites. But you can still print the pattern directly from your browser. 🙂 Happy crocheting! Could you explain what hdc2tog means? I understand hdc is half double crochet, but tog does not appear in the Stitches and Abbreviations. Hi I have made the sandals with the tassel I am myself so surprised I accomplished thanks for your patterns and video tutorials. I enjoy every one. Thanks from South Africa.